Searching for GAU-22/A cannon related threads / posts had me pulling my hear out earlier. You can try to search on gun or cannon, but if you want to search for "GAU-22/A", make sure you put double quotes (") around the search string, otherwise it will try to search for gau and 22 and possibly A and you'll end up pulling your hair out too. I started this thread to try to amalgamate information about the F-35's cannon into one location. I'm pretty sure this dispersian specification means that at 3000' range, for example, 80% of the rounds fired will fall within a 40' circle, and the 1-sigma radius means that 67% of the rounds fired will fall within a 4.2' circle. Orbital ATK specifies the armor penetration of the PGU-32/U to be 13mm RHA @ 30° at 1000m. Nammo quotes 20mm Armour Steel plate @ 45° NATO (? ), and 50mm Armour Steel Target plate 0° NATO. The Ammunition Data Wiki @ Steelbeasts.com lists the PGU-32 SAPHEI armor penetration at 45mm and the 30mm Apache round (30x113mm) M789 HEDP round at 46mm armor penetration. Combined with the Nammo PDF spec of 50mm @ 0° suggests that the F-35 25mm gun's anti-armor capabilities will be on the order of the AH-64 Apache's M230 30mm chaingun. The Nammo round may offer slightly better armor penetration compared to the PGU-32 SAPHEI round. Nammo makes a point that their round is being qualified on all three F-35 variants. I don't know if they mean to imply that the SAPHEI round will not. Perhaps someone can comment. “Comprehensive flight test on the F-35A variant GAU-22 25mm gun system is scheduled to begin mid-year at Edwards AFB, Calif., and will include ground fire tests, muzzle calibration, flight test integration and in-flight operational tests,” he wrote. The GAU-22/A, a four-barrel version of the 25mm GAU-12/U Equalizer five-barrel cannon found on the Marine Corps’ AV-8B Harrier II jump set, is designed to be internally mounted on the Air Force’s F-35A conventional model of the aircraft and hold 182 rounds. It’s slated to be externally mounted on the Marine Corps’ F-35B jump-jet variant and the Navy’s F-35C aircraft carrier version and hold 220 rounds. That’s a drop in the bucket compared to the 30mm, seven-barrel GAU-8/A Avenger in the nose of the Cold War-era A-10 Warthog attack aircraft, which holds as many as 1,174 rounds. But it’s actually more than the capacity of other existing front-line fighters, including the Russian MiG-25 and Eurofighter Typhoon, and enough to perform the close air support mission, according to Dave Stouffer, senior manager of business development at General Dynamics’ Ordnance and Tactical Systems unit. The weapon, one of many slated for the aircraft, is based on a design with a proven track record on both the Harrier and the AC-130 gunship, he said. Linked to the aircraft’s fire control and targeting software, it will fire highly accurate rounds at air-to-ground or air-to-air targets, he said. Also, the exposure point — the time it takes for the pilot to point the plane and its gun at a target — may only last a fraction of a second, translating to nine or 10 bursts of fire, he said. The Fighter Aircraft Gun Comparison seems to be an interesting comparison of aircraft cannons. It lists the spin-up time of the GAU-22/A cannon at 0.4 seconds, and that it fires 16 rounds in 0.5 seconds. If the GAU-22/A sends 4-5 rounds back to the magazine when it clears itself, then a burst of 16 rounds would consume around 20-21 rounds, which would work out to nine bursts of fire, plus or minus, and would seem to agree with the dodbuzz.com quote above. Does anyone know if the GAU-22/A gun on the F-35 will be burst-selectable in that the pilot could software select, say, a 10 round, or 15 round, or 20 round burst? I am thinking of a couple different ways to fire this cannon with the ammunition capacity that it has: a semi-auto-burst mode where you could select the number of rounds fired in a burst and only that number are fired with each press of the cannon trigger, or a full-auto mode where the cannon continues to fire as long as you keep the fun switch depressed. Since so much of the F-35 is software defined, this feature would seem to be a no-brainer, but I have not seen it definitively specified anywhere. So I ask. Wait, does that mean that the F-35 will only be firing 70 to 90% of the ammo actually loaded in it when it "empties" it's gun? Burst lengths can be selected. The only question is just how many options are available, for burst length. Suffice it to say, the pilot won't be emptying the magazine, with a single burst. NOTE: This post has been edited. As originally posted, it is incorrect and misleading. The edits reflect the fact that the GAU-22/A is reverse clearing, and undired rounds are returned to the feeding mechanism. No unfired shells are returned to the magazine in normal operation of the cannon. My original post is quoted below. Edits are in RED. I did it this way to preserve what I originally wrote so future readers could follow the thread, yet correct inaccuracies in what I wrote. count_to_10 wrote: Wait, does that mean that the F-35 will only be firing 70 to 90% of the ammo actually loaded in it when it "empties" it's gun? As I mentioned, the M61 Vulcan reportedly returns 5-9 rounds to the magazine when it clears itself after firing. 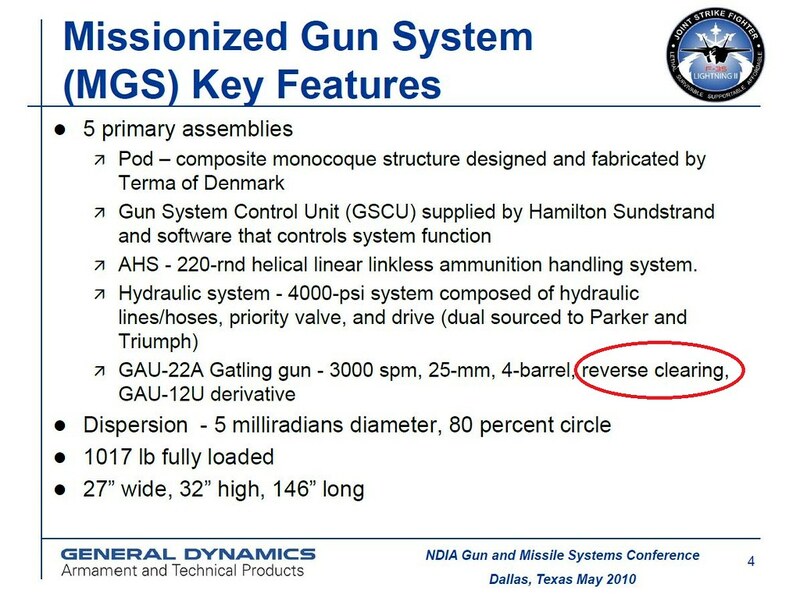 Unless the GAU-22/A doesn't clear itself after firing, or GDOTS figured a way to return unfired rounds to the feeding mechanism / magazine so they can still be fired, then to answer your question: yes, depending on how many bursts were fired. If you just hold down the fun switch until all rounds have been fired in one, continuous burst, then obviously you will fire 100% of the loaded ammo. If you fire two bursts, and four rounds are returned to the magazine after the first burst, you will have fired 98% of your rounds. Three bursts ~ 8-9 rounds returned for 95% of loaded ammunition expended. Nine bursts of fifteen rounds fired, five rounds returned: 75% loaded ammunition expended, 45 rounds returned. If only four rounds returned when clearing, then a nine bursts yields 16 rounds fired per burst, four returned: 80% loaded rounds will be fired. Personally, I think the Bk27 might have been a better choice as far as an auto-cannon goes, but that ship sailed a long time ago. If they had used the Bk27, the USMC, among others, loses any possible logistical advantage to using the same calibre round in their ground machines (LAV-25) and the F-35. Granted, they use different rounds, so the logistal advantage may be overstated. Having said all that, I don't think it is necessarily a bad thing. Yeah, I'd like to be able to use 100% of my loaded rounds, but if the software permits me to fire only 15 rounds at a time, and enables me to accurately target those 15 rounds, that may be all I need. Last edited by steve2267 on 31 Dec 2016, 17:33, edited 1 time in total. Right, I should have said "any plane with a Gatling gun". Of course it isn't specific to the F-35. It occurs to me, though that, if the ammo belt is one continuous feed that can cycle around multiple times, then you should be able to leave a full burst worth of rounds unexpended after each fired burst. That might be complicated if the pilot wanted to change burst length in flight, but the computer should be able to set things up so that those skipped rounds could be fired in bursts on the second pass through. Does anyone know if it was possible to fire those skipped rounds (if sporadically and unpredictably) on legacy platforms? count_to_10 wrote: It occurs to me, though that, if the ammo belt is one continuous feed that can cycle around multiple times, then you should be able to leave a full burst worth of rounds unexpended after each fired burst. That might be complicated if the pilot wanted to change burst length in flight, but the computer should be able to set things up so that those skipped rounds could be fired in bursts on the second pass through. I will say that may be theoretically possible, but practically impossible. From a computer engineering point of view, yes, the computer should be able to count the shells if you could run them back through the gun again. From a mechanical engineering point of view, this would be a nightmare. Note that you are violating the KISS principle. First, to "find" those unfired shells, you will have to cycle every shell back through the firing mechanism. At 3300rpm, it will take 3.3 seconds to run each round through the firing mechanism. So for a fleeting firing opportunity, you may have to wait upwards of 3 seconds for unfired shells to be re-fed through the gun. I would imagine, in combat, holding the trigger down for 2-3 seconds while keeping the pipper on the target waiting for the gun to spit out a few more shells would be next to eternity. Second, it seems reasonable to assume every shell that has been fired will have expanded slightly from the pressure of the burning propellant gases. If you have ever fired a revolver, you probably have noticed the the "fired" rounds do not slide out of the cylinder as easily as the unfired rounds because they have expanded slightly. You are talking about trying to re-feed fired, empty shells back through the breech. Without a projectile, the unfired cases will just have a sharp, blunt leading edge. If not precisely aligned with the breech, the unfired case will not smoothly enter the breech and will jam the gun. And you are trying to do all this at 55 rounds per second! A redesign of the breech, at a minimum is probably in order. So while an interesting programming problem, I do not think this is anywhere near practical from a mechanical engineering perspective. count_to_10 wrote: Does anyone know if it was possible to fire those skipped rounds (if sporadically and unpredictably) on legacy platforms? In some of the videos of the GAU-22 test fires, the gun spins backwards after firing. This might be to clear the unfired rounds back out into the feed chute. The M61 cannot cycle in reverse. cantaz wrote: In some of the videos of the GAU-22 test fires, the gun spins backwards after firing. This might be to clear the unfired rounds back out into the feed chute. The M61 cannot cycle in reverse. I never noticed that before - an excellent observation. In this video you do in fact see the gun spin in the opposite direction briefly (appears to be about one revolution). count_to_10... it looks like the engineers got your 25-30% back through an elegant solution! It appears this reverse clearing was a feature of the GAU-12/A as well. Here is a video of the SeaVulcan25. @ 2:45 and 4:05 you can clearly see the barrels reverse briefly after firing. Found it! From page 4 of the TuesdayLandmarkADouglasParker.pdf paper attached in post #1 of this thread, the GAU-22/A is reverse clearing. So everything I posted earlier is INCORRECT for the GAU-22/A. It would have been correct if the GAU-22/A cleared itself in the same manner as the older M61 Vulcan design. This makes sense and is good to know: all BB's in the F-35's magazine are available to be fired. Does anyone know (and can share) or has read what gun functionality will be included in the Block 3F software? Will it be fairly basic like just a boresight pipper and burst round count selector? Or will it also include features like a CCIP (for CAS / ground attack) and LCOS for air-to-air? In air-to-air work, will there be any provision for a TOF/LCOS-only sight based solely on ballistics and aircraft motion in case the radar is offline, damaged, or jammed? If you don't have range information (e.g. radar unavailable), then I'm thinking something like the Viper's gun funnel might be appropriate? On the other hand, if you had DAS sensors near opposite wing tips, you could compute range from the distance between the DAS senors (i.e. binocular vision). Then you wouldn't need the funnel and would just need to deal with a dancing pipper. That would make a lot more sense -- though it would mean loading those "expanded" casing backward through the chamber. Though I have to say, I can't distinguish a backward motion in that clip from the optical illusion created by the video frame rate. Full A/B/C gun usage is included in 3F. High pitch rate at 7:08 https://youtu.be/PfGuwS2tGPg?t=428 -- thermal exhaust plume from the F135 gives an indication of pitch rate being pulled -- it seems to have some pretty good curvature to it.